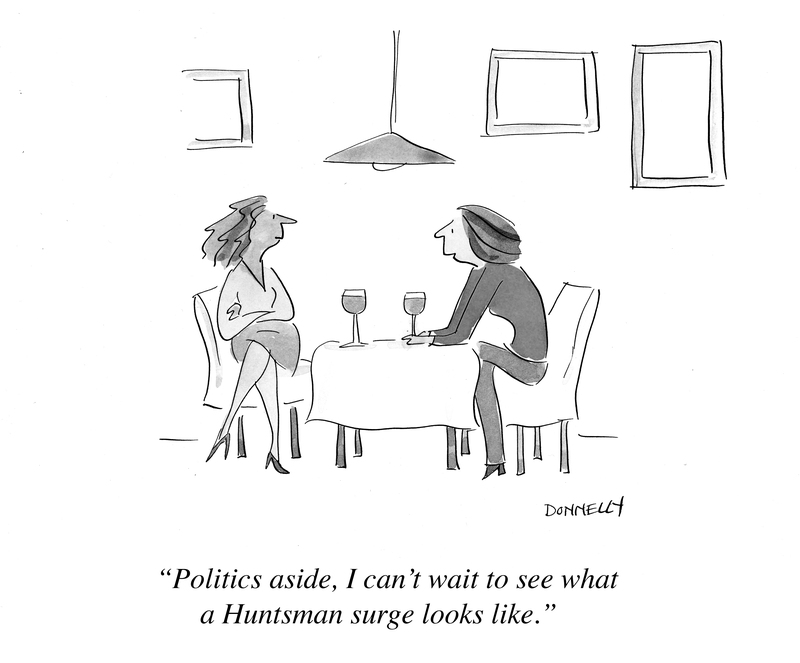 What Does a Huntsman Surge Looks Like? | When Do They Serve The Wine? What Does a Huntsman Surge Looks Like? If I were a Republican, I would find Mr. Huntsman very attractive. It’s not news that he’s classically handsome, and if I were a Republican, I would find it difficult not to gravitate towards him. If only for his looks. What else is there to go on? Why not make a choice based on looks? Heck, at this stage of the game, they are all not telling the truth anyway. The lukewarm attitude towards Mitt reminds me of a cartoon of mine that The New Yorker published in 1983. You can just insert Mitt Romney’s name in the fortune cookie caption. 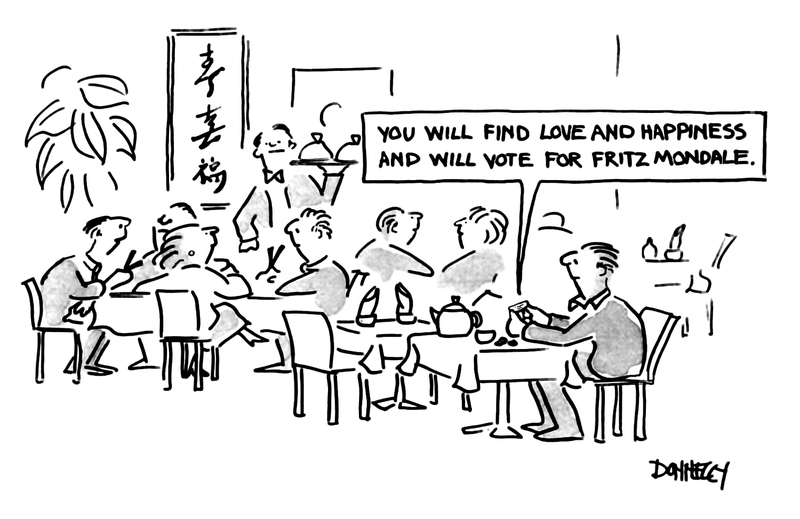 It’s about the Democratic Presidential nominee Walter Mondale, and the cartoon reflects the tepid feelings towards Fritz by the Democratic party. I don’t recall there being such a circus back then as we have now, however. Also, parenthetically, this cartoon was my second sale to The New Yorker, and my first political cartoon for them. This entry was posted in News, Random but Relevant and tagged Cartoon, Democratic, Fritz, Huntsman, New Yorker, Politics, Republican, Walter Mondale. Bookmark the permalink. 3 Responses to What Does a Huntsman Surge Looks Like? I am a Japanese female, 31 year old, living in Kyoto, Japan. and very impressed by your talks about how humor can make an impact and change the world. I started cartooning and now post them to my blog daily. If you think I can help your activities in any way, please let me know. I’m more than happy to be a part of it. Shiori, Thank you for your kind comment! I looked at your work, and it is very nice (although I cannot understand it, sorry!). Many thanks, and I send warm wishes. I’m fully expecting to wake-up some morning, to find that I have likewise surged. And I’m not even a Republican. Nor am I classically handsome.